Could you help shape training for doctors of the future? There’s a very exciting opportunity to help inform the new curriculum for specialist doctors who are training in gynaecology and obstetrics. The Royal College of Obstetricians and Gynaecologists is looking for a range of people to join a new public insight group to help identify the communication skills and clinical knowledge that doctors need to give the best possible care. The curriculum is updated every so often to ensure that new evidence or technology is taken into account, and the RCOG is committed to involving people who use services in all aspects of their work. Although the expertise of experienced doctors is vital, it is just as important to involve service users to hear what knowledge and skills they feel specialists of tomorrow should have. The Public Insight Group will aim to include people from across the UK with a variety of needs and experiences. It may also include representation from individuals who have particular understanding of the needs of specific communities and can represent the experiences and needs of those groups effectively. 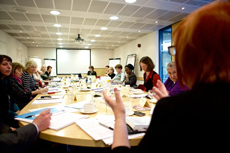 There will be a core group of around 20 people who will meet face-to-face for an initial workshop session. After this, the group will be coordinated mainly by email as the new curriculum develops. A wider consultation group will bring a broader pool of views into the project. This group will only be involved by email. Both the core and the wider group will play a crucial role in informing the new curriculum over the next year. Both groups will be communicated with regularly to gain insight and feedback will be given to members about how the new curriculum is progressing.